JC Penney took down the billboard after receiving complaints. 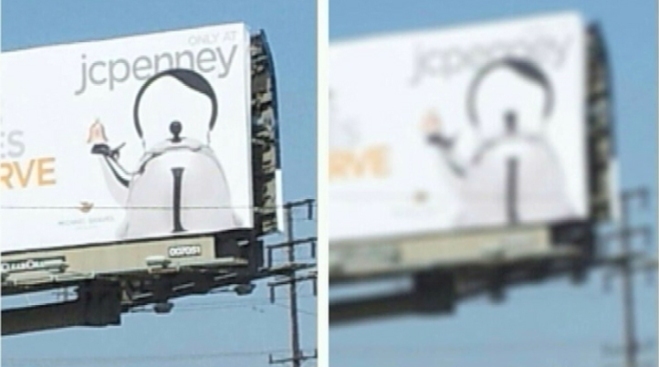 Observers on the Internet felt that this tea kettle looked like Adolf Hitler, the late German dictator who presided over the Holocaust and started World War II. Sometimes, a teapot is just a teapot. Other times, it sort of looks like Adolf Hitler if you squint. That's apparently the case on a JC Penney billboard in Culver City, Calif. Photos of the big ad posted to social media websites have gone viral, prompting the retailer to take down the billboard. Viewers argued that the teapot looked almost like a minimalist caricature of the late German dictator, who masterminded the Holocaust and whose aggressive annexations of other countries led to World War II. The teapot's rounded handle swoops down to the right, much like the despot's hairstyle. A little knob atop the lid looks a little bit like his signature mustache. A thin, vertical reflection in the metal of the pot falls right about where a necktie would hang. The teapot's spout juts out like a Nazi salute. JC Penney has responded to angry, offended and amused Twitter users. "Certainly not intentional," the company tweeted. "We would have gone with something cute. Think 'puppy dog', not dictator." The company then posted a photograph of another teapot, saying, "If we'd designed the kettle to look like something, we would've gone (with) this." The new teapot was sculpted in the likeness of a smiling snowman holding some sort of red bird. @jaffejuice@AdscamGeorge@BobKnorpp Certainly not intentional. We would have gone with something cute. Think "puppy dog", not dictator.